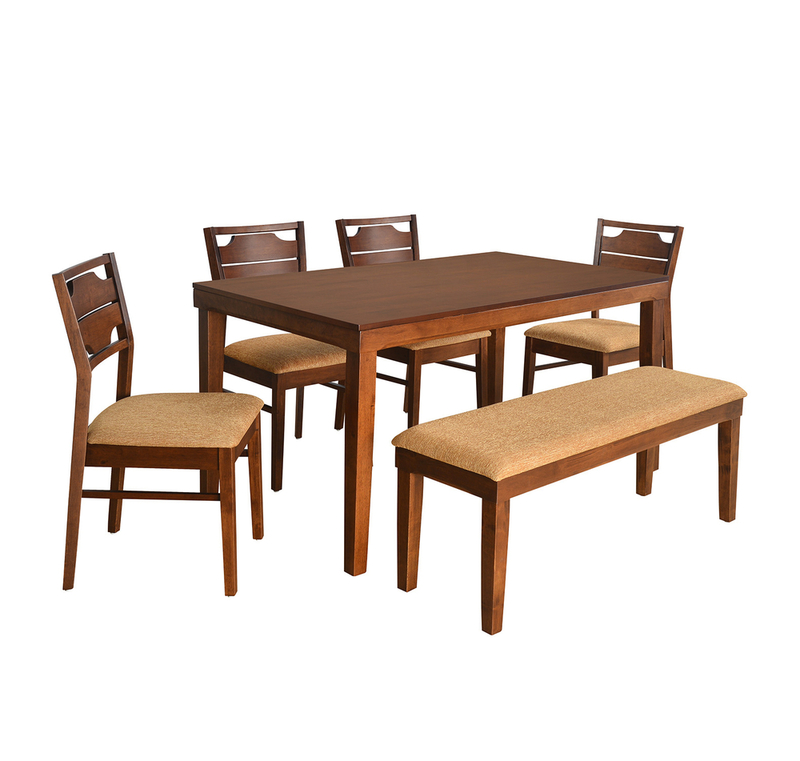 Simplicity speaks through the beauty and sophistication of this lovely dining set. The place where you spend time together as a family should really be the best possible piece of furniture in the house. This Olenna dining kit is absolutely ideal for that. The material used is solid rubber wood, giving the whole frame of the table, chairs and the bench a strong support. The table top comes in a smooth layer of MDF, topped with veneer, making it extra shiny and also easier to wipe and clean. The MDF and veneer protects the wood from any harm from the brunt of daily use. As for the chairs and the bench, they have been engineered keeping in mind the comfort and convenience of the user. Cushions of 22 kg per cubic meter foam density, covered with layers of micro woven fabric make sure of those factors, in both the chairs and the bench. The most fascinating thing about it is the colour – the brilliant shade of brown and walnut is an all-time classic. The bench brings a change in the look, and is also quite practical an option to use in case of space constraints. Buy this perfect piece of furniture from @Home. Solid wood Provides Sturdiness.Bench can be arranged Underneath the table/anywhere in room when not in use which makes it ideal Space saver.Ideal Substitute for chairs when there is space Constraint.Can be match with any décor.